If one browses through the history section of any major bookstore these days, it would seem that to make a book marketable it must discuss some ‘forgotten’ aspect of a well-known historical event or profess to tell the ‘real’ story behind whatever genocide, war or other tragic event the book discusses. 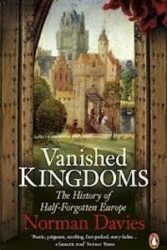 Vanished Kingdoms by Norman Davies, while the title ticks the relevant boxes, is a little different. Without sliding down the slippery path of counterfactual history, Davies digs through some of the more obscure kingdoms and nations that have risen and fallen throughout the course of European history to unearth an alternative history of the continent. Not all the areas covered can claim to be obscure; most people will have a familiarity with the USSR, for example. Davies, however, does bring some interesting approaches to their collapses, like looking at the fall of the USSR from the Estonian perspective. The book takes us through fifteen different vanished kingdoms of varying size and significance. Each kingdom has its own dedicated chapter, some of which are more well-known than others. Alt Clut, anyone? Chronologically the book begins in the fourth century AD in Byzantium and brings us right up to the present with the unfinished vanishing act of Éire and the United Kingdom. The reign of these kingdoms also greatly varies, from the 900 years of Sabaudia (1033-1946) to the one day of Rusyn (15 March 1939). While drawing direct comparisons between kingdoms can sometimes be a stretch, they all fit in with the book’s main theme of the transience of nations. This book is written with modern Europe in mind. ‘Imperial nations, and ex-imperial nations, are particularly reluctant to recognize how quickly reality moves on.’ (p. 6) Throughout each chapter we are reminded of the fluidity of nations and their borders. Indeed the chapter on Éire makes the point that the United Kingdom began disintegrating in 1922 and the dissolution is by no means finished yet. Davies lays out his structure very clearly from the outset of the book, although the distinctions between sections are sometimes blurred. His main priorities are, as he states, to highlight the contrast between times present and times past and to explore the workings of historical memory. With this goal in mind, each chapter is divided into three sections and presents the reader with: a sketch of a European location as it appears today, a narrative of the vanished kingdom that inhabited that area and an analysis of the extent to which said kingdom has been remembered or forgotten. This structure is followed throughout the fifteen chapters and is more suited to some rather than others. The layout is conducive to a state by state reading and the reader can dip into each chapter as fancy dictates. While each chapter works as a self-contained entity, I would have liked to have seen more comparative analysis. The conclusion, a mere ten pages long, serves to tie the themes together. However, there is the question of what connections can be made between the ‘heap of broken images’ that make up the case studies for this book. For the general audience this book brings some of the less well-known aspects of European history to light, while looking at others from a fresh angle. Davies, perhaps due to the breadth of this book, is here more of a storyteller rather a serious analytical historian. Each opening section to the chapters reads like a travel guide along with the author’s impressions of the country. Most are quite positive but they sometimes run the risk of conforming to stereotypes. The writing style is also affected by the region he writes on: the chapter on Galicia takes on airs of Jaroslav Hašek in its light jokey style, while the section on Éire descends into misty-eyed romanticism with a helping of Danny Boy for good measure. However, Davies’ knowledge of the landscape helps to set the scene for the reader, and the maps and family trees of the various royal families are very helpful in a book where the reader will be asked to leap from one end of Europe to the other. From an academic point of view, this book raises some rather valid questions. The study of history focuses far too much on the ‘winners’, thus forcing us to read history backwards. Davies laments the trend among historians who consider the powers which are important today are also those whose past is the most ‘deserving’ of examination. However, while it is a truism that one studies history to understand the present, tunnel vision in focusing on the bigger powers, the USA or China at present, means that we fail to grasp a more comprehensive understanding of history. This is also true of the prevailing focus on modern history, as if one can discount events before Napoleon, or in some cases, before the twentieth century as insignificant. While this debate is certainly not new, Davies himself cites a similar argument from Hugh Trevor-Roper, which is worth repeating. As the current ships of state sail onto their destinations, this book encourages us to remember those that have crashed and foundered on the way.